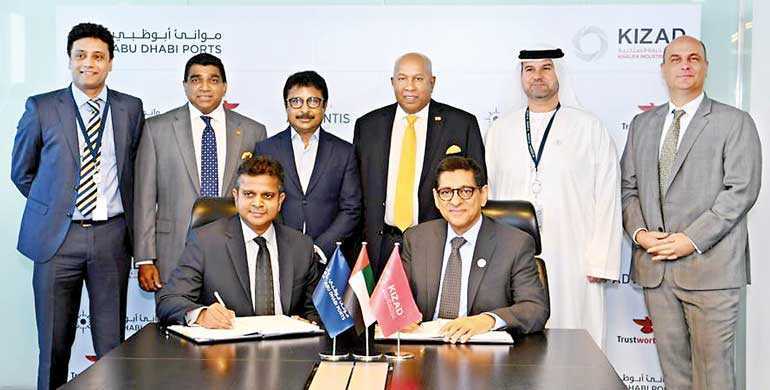 Hayleys Advantis Ltd. (Advantis), the transportation and logistics arm of Hayleys PLC, announced that it has entered into a landmark deal with Dubai-based Trustworthy.ae Group. Advantis is to operate and manage a state of the art Inland Container Depot (ICD) and third-party Container Freight Station (CFS) being developed by Trustworthy.ae Group in the Khalifa Industrial Zone Abu Dhabi (KIZAD). Advantis had to compete with seven local and international bidders for this project, which marks its first foray into the Middle Eastern market. KIZAD, a subsidiary of Abu Dhabi Ports, is one of the largest industrial zones in the Middle East. Its container volumes are expected to grow exponentially from 1.5 million TEUs to 8.5 million TEUs over the next five years. In line with this, the Trustworthy.ae Group is investing nearly $ 100 million to develop an ICD, CFS and other port-related services in KIZAD over this period. Advantis, who brings in two decades of experience in managing ICDs, has been tasked with operating and managing the container depot and freight station to be built on a 1.4 million sq. ft. plot. With construction commencing in January 2019, the facilities are set to become operational by June 2019. Hayleys Advantis is Sri Lanka’s leading logistics solutions provider, representing and working with some of the world’s most noted names in shipping and freight. The company has been providing services for container storage, repair and refurbishment for over two decades and currently operates two Inland Container Depot (ICD) facilities. Strategically expanding its reach beyond Sri Lanka, it currently has operations in 10 countries in the South Asian region. Hayleys Advantis is the transportation and logistics arm of blue chip multinational conglomerate Hayleys PLC. With six decades of experience and operations spread across the Asian region Advantis offers end-to-end solutions covering air, land and sea. It is committed towards being an innovator in the industry, setting the pace and shaping the logistics category.